Search engine toolbars for the Internet Explorer browser have become nearly essential tools online: They can block pop-up ads, alert you to new e-mail, even protect you from scams. You'd need a half-dozen to combine all the best features, the Internet equivalent of leaving home in the morning with six different wallets. So to narrow the choice I tested 11 — two of which, from America Online and EarthLink, debuted Monday. Toolbars from the search leaders — Google, Yahoo!, Microsoft and AOL — all have decent pop-up blockers that kill windows I don't want (ads) and permit ones I request (shipping details, for instance). And they're all a snap to download and install. The Google Toolbar includes an extremely useful feature for frequent online shoppers. It automatically fills out online forms, such as name and address. A password protects stored credit card information. And if you keep a Web journal using Blogger software, which Google bought last year, you can add entries from the toolbar. A small bell appears on the Yahoo! Companion Toolbar when users of Yahoo e-mail accounts have new messages. You can also access bookmarks of favorite Web sites that you've stored on Yahoo. What I like best about the Yahoo toolbar is its portability. Settings are stored online, so you can customize it or add bookmarks wherever you are. As for Microsoft, you can launch Hotmail and Messenger from its MSN Toolbar, but there's nothing special once you're there. 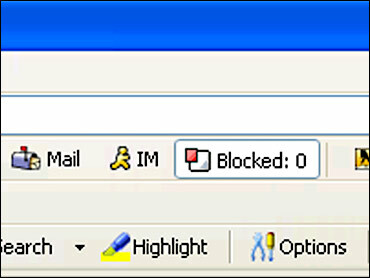 The AOL Toolbar displays the number of mail messages you have — if you're logged on already through AOL's regular software. Yahoo outperforms MSN and AOL by allowing sign-ins from the toolbar, but Google outshines all of them. I found its search engine and extra features most useful. It even has a green bar that shows the relative popularity of the site you're visiting. Among the rest, toolbars from Dogpile and Ask Jeeves have decent pop-up blockers. AltaVista and EarthLink make mistakes recognizing legitimate pop-ups, and Alexa keeps popping up annoying prompts asking whether I want that pop-up or not. Dogpile, Ask Jeeves and Alexa have buttons for mailing Web links to a friend. Alexa's was the best. Dogpile supports an emerging technology called Really Simple Syndication, or RSS. With it, headlines from your favorite Web journals, news or other RSS-enabled sites scroll across the toolbar. Ask Jeeves lets you shrink and expand entire Web pages — not just their text in the more limited manner of the Internet Explorer browser. Alexa, owned by Amazon.com, suggests related sites, as in "People who visit this page also visit ..." It's similar to Amazon's shopping recommendations. And should a Web site disappear, a copy at the Internet Archive may be reachable with the click of a button. AltaVista has a button for translating text to and from other languages. With it, you might get at the gist of what's going on. EarthLink blocks fake EarthLink, eBay and PayPal sites that try to steal your passwords or credit card numbers. It also searches your computer for malicious programs known as "spyware," though to remove them, you need an EarthLink account. Among these features, EarthLink's ScamBlocker is the most promising, especially once sites identified by the anti-spam company Brightmail are added next month. I also tried GuruNet, which helps you cull useful information from the junk by narrowing results to reference materials like encyclopedias and maps. It reduces clutter. But unlike the others I tested, GuruNet requires a cash outlay — $29.99 a year. I like Dogpile's RSS scroller and Alexa's recommendations. In both cases, there's a trade-off. They collect information on surfing habits, so read their privacy policies carefully. Most people will probably be fine with either the Google or Yahoos toolbar, unless there's a specific feature they'd use a lot — perhaps because you frequent foreign sites (then download AltaVista's as well) or have poor eyesight (use Ask Jeeves). Sadly, however, all these toolbars work only on Windows computers running Internet Explorer. For other browsers, try GGSearch, a standalone application that looks like a toolbar. You get basic Google searches but not extras like pop-up blockers. Or use Opera's browser, as I do. It has the Google search box and pop-up blocker built-in, though its form filler isn't as good.